This post is part of a series examining women’s labor force participation in the Gulf Arab states, including areas of growth and challenges facing women in the Gulf. As Gulf Arab countries seek to diversify their economies away from oil, they have made major investments in the manufacturing sector, which contributes on average around 11 percent of gross domestic product in the region. Favorable tax regimes and the relatively low cost of establishing and operating industrial facilities in the region are major factors attracting investors and driving growth in the manufacturing sector. However, Gulf Cooperation Council manufacturing is highly dependent on male foreign workers from South Asia and there is a lack of skilled labor in the field among Gulf nationals, both male and female. Recent economic diversification initiatives across the Gulf Arab states such as nationalization programs in the private sector have helped shape policies to support the training and hiring of nationals, and improve women’s education and increase their participation in the workforce. Furthermore, the need for dual income households has prompted women to seek work, and economic diversification initiatives have provided opportunities in sectors such as manufacturing. Strata was founded in the United Arab Emirates to train nationals in the aerospace manufacturing industry to support the UAE vision 2030 goal of creating a knowledge-based economy. Given the limited talent pool and a general lack of interest on the part of Emirati women in the industry, Strata held targeted awareness campaigns to promote its vocational training program and showcase its flexible career opportunities offering a work-life balance. Now, Emirati women at Strata comprise 50 percent of team leaders and 40 percent of all Strata employees. Other Emirati manufacturers have similarly sought to attract more women to their workforce. Tawazun, an industrial manufacturing company, provides flexible working hours for women and built a day care center on site. Emirates Global Aluminum provides scholarships to women to study engineering with guaranteed employment in technical roles after graduation; currently more than 16 percent of staff working at a supervisory level and above are female. Despite these initiatives, labor laws in most Gulf Arab countries prohibit women from working in specific jobs such as those in factories, construction, mining, water, energy, and metalworking. Such laws are not unique to the Gulf Arab countries – they are common throughout the non-OECD countries. According to the World Bank’s “Women, Business and the Law 2018” report, 104 countries have laws preventing women from working in specific jobs. 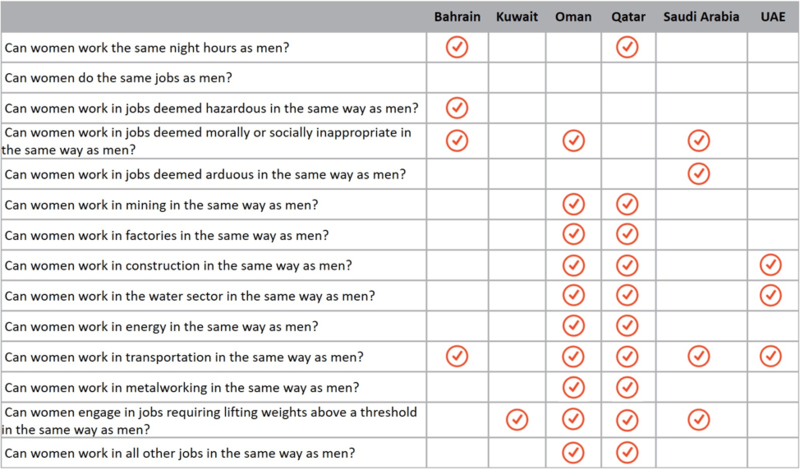 In 29 countries, including four GCC states, women cannot work the same night hours as men. The justification for the restrictions is mainly that such jobs are deemed hazardous and arduous for women. Perceptions of women’s education and participation in the workforce have been changing in the Gulf states, opening up avenues for inclusion. A decade ago, about 30 percent of university-age women in Saudi Arabia attended university, while today it is about half. A recent Gallup and International Labour Organization poll asked both men and women if they believe it is acceptable for any woman in their family to have a paid job outside the home if she wants one. Eighty-five percent of respondents in the UAE agreed with that statement, along with 82 percent in Bahrain, 74 percent in Saudi Arabia, and 68 percent in Kuwait. However, when the same people were asked if they preferred women to work at a paid job, stay at home to take care of family and housework, or do both, more men preferred women in their family to stay at home. While Gulf Arab states are underperforming when it comes to women’s economic participation and opportunity, health and survival, and political empowerment, their scores are much higher in educational attainment for girls and women. 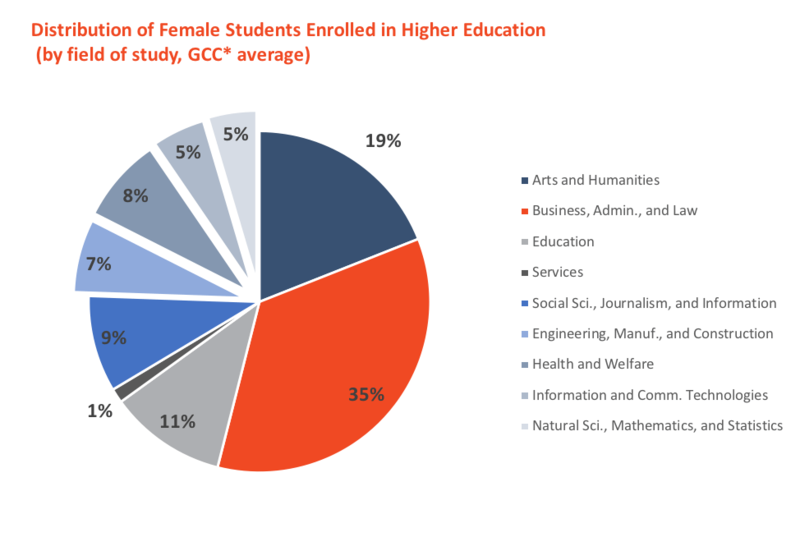 However, when it comes to women’s choice of field of study in higher education, 25 percent of female students in Bahrain, Qatar, Saudi Arabia, and the UAE select STEM-related fields, as opposed to 40 percent of male students. As a result, across industries such as manufacturing, energy, and mining, the talent pool available will exhibit weaker gender parity. In April, Saudi Aramco announced the appointment of the first woman to its board. Although this announcement was considered a milestone, women’s involvement in the oil and gas industry in the Gulf started in the early 1980s and there have been many role models in the field. Sara Akbar is one of the pioneers in oil and gas in the Gulf. Her father worked at oil fields in Kuwait, where she was born. She studied chemical engineering at Kuwait University and worked as a petroleum engineer with Kuwait Oil Company. During the Gulf War in 1991, when Kuwait oil fields were set on fire, she was a member of the team that created the Kuwait fighter-fighting team. In 2005, Akbar co-founded Kuwait Energy, a successful independent oil and gas exploration and production company. Another pioneer is Intisaar Kindy, the exploration director at Petroleum Development Oman. She started her career as a petroleum geologist and has held leadership positions in Oman, the United Kingdom, the United States, and Jordan. Kindy is the president of Petroleum Development Oman Women Network and an advocate for women in energy. According to a study by the Boston Consulting Group and the World Petroleum Council, the oil and gas industry has the second lowest share of women after construction globally. Although the number of women entering the oil and gas industry is increasing, women tend to get trapped in entry-level jobs and they are underrepresented in mid-career and senior-leadership positions. To address this issue, Shell has two programs designed for women in leadership positions: Women’s Career Development Program and Senior Women Connect. Shahad Al Wahaibi was part of the Women’s Career Development Program in Shell Oman and was responsible for 23 Shell service stations in terms of health, safety, security and environment, operational excellence, and sales. Wahaibi noted the importance of Shell Oman’s coaching sessions for women. The Abu Dhabi state oil and gas company is also working to increase the number of women in leadership positions; the company’s CEO announced its commitment to increase women in senior management roles from 7 percent to 15 percent by 2020. As the Gulf Arab countries start to increase women’s participation in the manufacturing sector, there is a growing concern whether this will be a sustainable economic diversification strategy not only for women but for the general population. This is particularly a concern in countries like the UAE and Qatar, where nationals comprise less than 10 percent of the population. GCC countries’ job creation strategies will predominantly require creating high paying private sector jobs for their nationals, which are unlikely to be in the manufacturing sector. Another concern for GCC countries when it comes to the allocation of their local talent is the effect of technology on the manufacturing sector. It is estimated that the manufacturing industry will be most affected by technological advancements such as automation, robotics, 3-D printing, and artificial intelligence. For example, 10 percent of manufacturing tasks globally were performed by robots in 2015. This percentage will rise to 25 percent by 2025. Initiatives to increase women’s participation in the workforce in GCC countries should be supported by changes in local labor laws that currently place restrictions on women’s employment. This will allow companies in the private sector to open up new job opportunities for women. The implementation of quotas, which are already present in some GCC initiatives, has also proved successful at reducing gender inequality at work. The vast reorganization of fiscal policy in the Gulf Arab states has upended decades of practice in cyclical government spending tied to oil revenue. is a former visiting fellow at the Arab Gulf States Institute in Washington.